Can we talk about life? I don’t mean in the existential or theoretical sense. I want to talk about real life right now. No matter where you live or what you do, I bet you know life has ups and downs. Your peaks and valleys are different than mine, but we both experience highs, lows and even a few plateaus in between. Now answer me this: Why is it that we go through life as if crisis will never occur? We can’t predict every twist and turn on the road of life but one thing is absolutely certain: The road is never, ever straight for long. Take last week in my home, for example. On Sunday, I had a perfect plan to cover spring break. The oldest would go to day camp. The youngest would go to preschool. Mom would go to work. Dad would go to work. Meals were planned to keep food spending under budget. Laundry caught up and put away. We had a well-oiled machine ready to go. Monday morning was a dream. Everyone was off to their respective places on times and even in matching clothes. By that afternoon, the machine started to sputter. Preschool called to say the littlest had a fever of 102. Hubby dropped everything to pick her up while I raced to figure out child care for the next day as required by the center’s fever policy (can’t come back till at least 24 hours have passed without a fever). She was sick and miserable. He wanted to pick up food to make things easier for dinner. Reasonable, right? I say fine, because I’m stuck at the office trying to nail down a Plan B in case a sitter can’t be found and I need to stay home with her the following day. If you have young children who are sick and you ask them what they want to eat, what would they say? McDonald’s? A burrito? Soup? Not my kid: Thai noodles. So off hubby goes with both girls in tow to a local Thai restaurant to order Pad See Ew, green curry, dumplings and sticky rice. There goes $40. Found a sitter for Tuesday – score! There goes another $40. Suddenly, the week goes from well-oiled machine to being held together by duct tape and bailing wire. Things go sideways at every turn. The meal plan – and budget for the week — fly out the window, as does any shred of sanity I thought I might have. My prayer is simply for us all to survive till Friday when we can catch our collective breath. Am I alone or have you been there, too? Interrupted schedules, unplanned experiences and defaulting to survival mode. Maybe for you it’s car trouble – an unexpected traffic ticket or repair. Or the illness is more serious and ends up in hospital and prescription costs. Your line of work might be different than mine and instead of $40 to a sitter, you get $80 in lost wages to stay home with your sick child. Despite our differences, I bet we both feel like our hair is on fire and there is no extinguisher in sight. What if we didn’t have to live like this, riding the peaks and valleys of life as if on a rollercoaster? 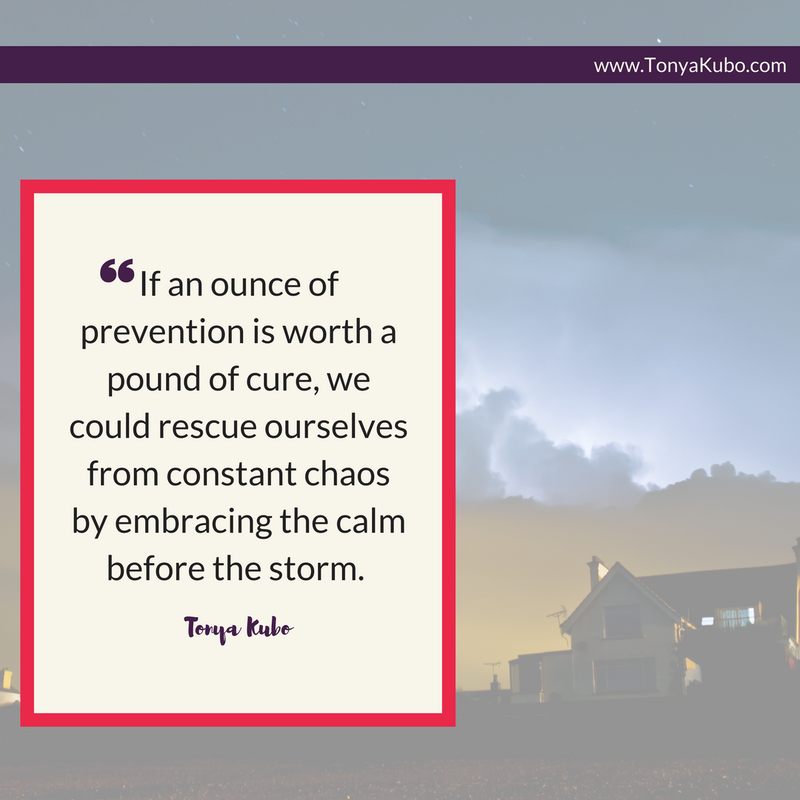 If an ounce of prevention is worth a pound of cure, we could rescue ourselves from constant chaos by embracing the calm before the storm. 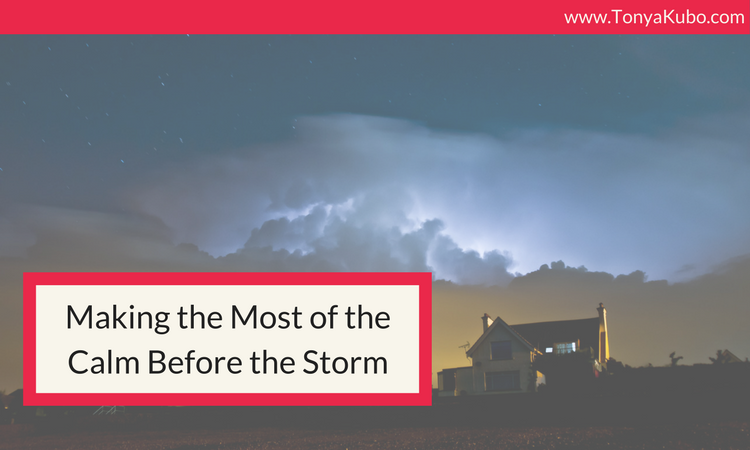 What would happen if we took time when things were calm to prepare for the inevitability that at some point in the future, they won’t be? This week, I want to explore what we can do right now so that tomorrow, we’re not stretched so thin that we feel transparent. But first, I need some help from you. 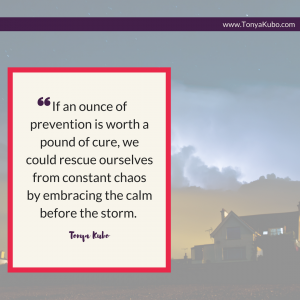 Comment here, on Facebook or send me an email to tell me which types of unplanned events reach crisis level in your home and leave you praying for survival? What if you wake up tomorrow with the flu? What if you or your partner lose your job? What if one of the kids gets sick and has to miss school or daycare? What if “sick” means real sick and someone in the house needs to be hospitalized? What if fraud empties your bank account? What if your hard drive melts down? What if you need to hop a plane tomorrow? I can’t wait to hear your thoughts on the subject and share them with others who are in the same boat. Let’s continue the conversation. I think the worst are the ones you just cannot predict nor control. Kids being sick just happens no matter how great we feed them, cloth them and take care of them. Sickness and injury happen. This for me is huge since I am self employed and when they get sick I often am low on hours to take care of them and then get sick myself. This is a giant loss for our income.